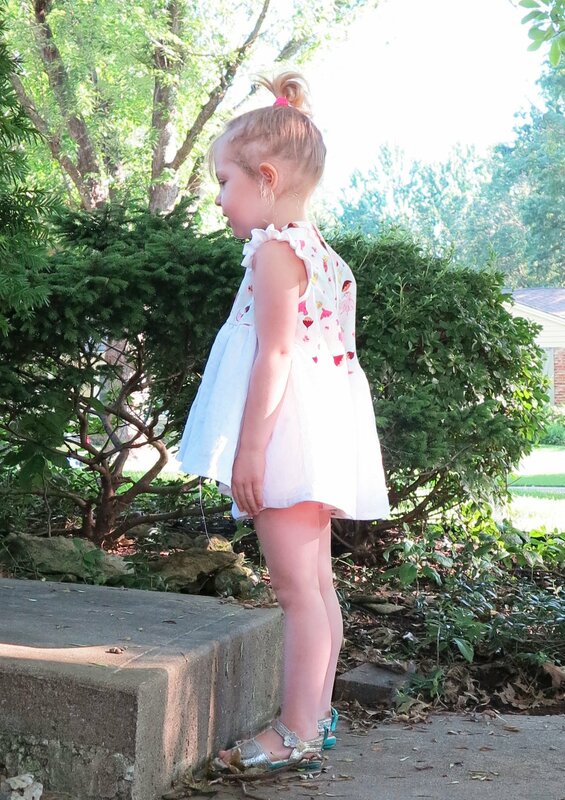 I made this Daisy Chain top specifically to go with Miss Three’s fairy shorts. I salvaged my last little bits of fairy fabric and paired it with a little bit of white linen. 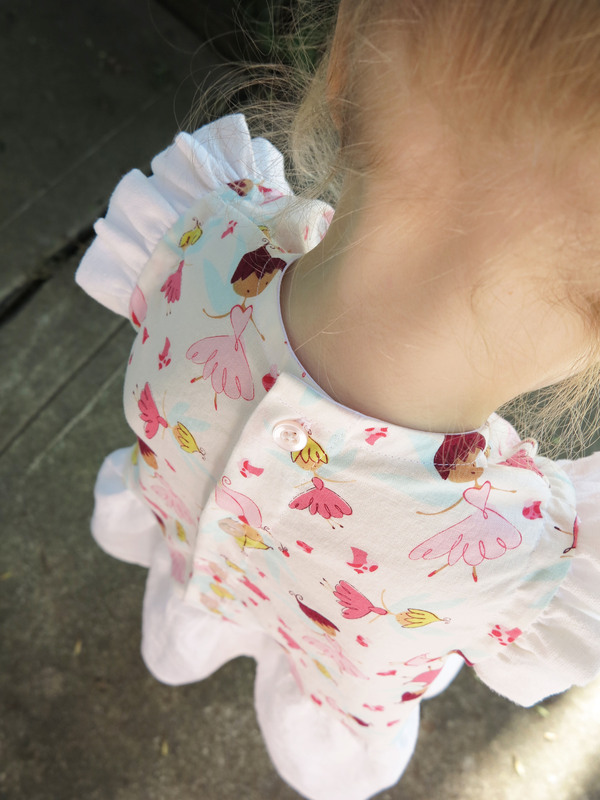 I bound the hem with self made binding in a floral that co-ordinates with the fairy fabric. Unfortunately, it doesn’t match perfectly. I didn’t have any suitable white binding on hand or enough fairy fabric, or any confidence that I would like the look of a top with fairies on it anyway. For the back placket, I made use of what buttons I already had on hand (quite boring but in the perfect subtle shade of pearl blush). I’m not usually a fan of novelty fabric (heaven knows why I purchased the fairy cotton in the first place). My plan was to simply get those fairy faces out of my stash. 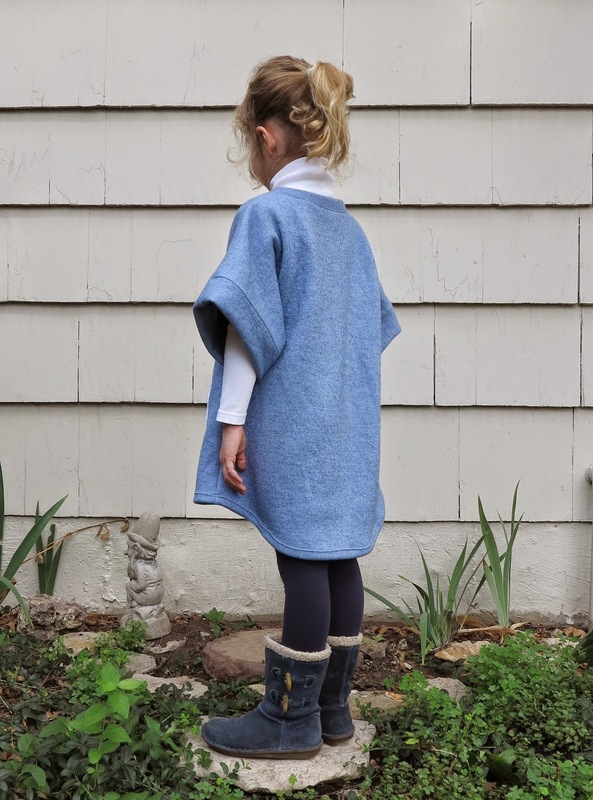 It has, however, turned out to be one of the sweetest things that I’ve made for this child. 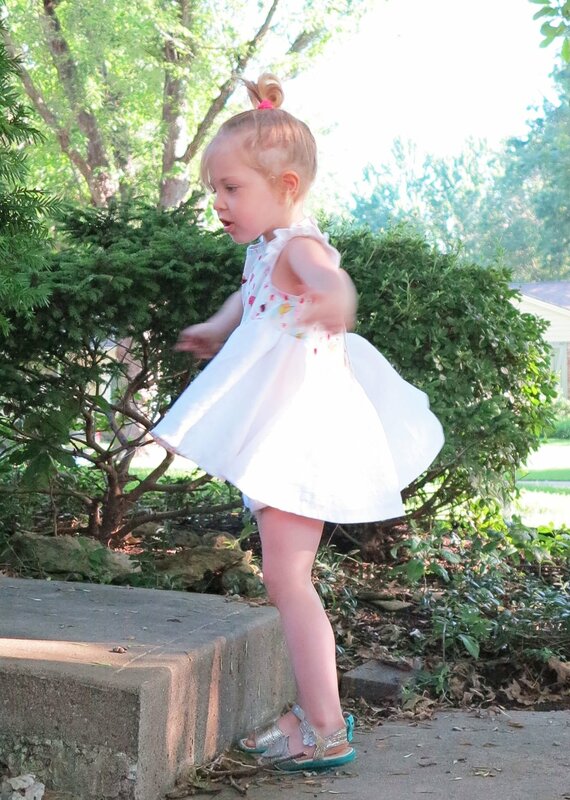 I catch myself admiring her each and every time she twirls by. 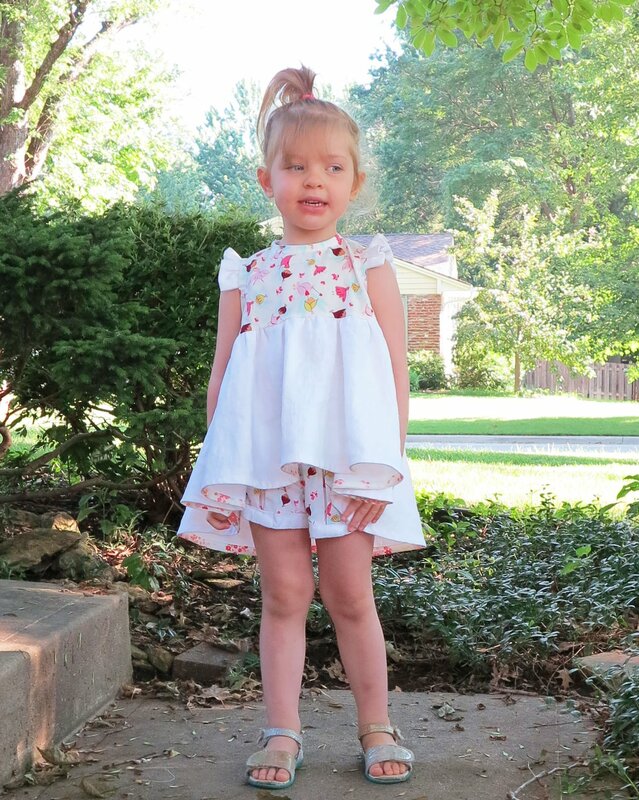 This entry was posted in cotton, drape, dress, Fabric.com, flounce, Lily Sage & Co patterns, patterns, shorts, top, tunic, white and tagged Cartwheel Shorts, Daisy chain top, linen, shorts, top, white on July 14, 2015 by Debbie Iles. So once again, my plans to sketch this dress fell through. However, I did manage to use up the rest of my little bitty leather scraps (from here) and my black ponte (from here), so I’m going to give myself a high five for scrap busting anyway. The dress is basically a modified version of Vogue 8840 (seen before here, here, and here) with a bit of leather embellishment. I used a metal ruler and a sharp rotary cutter to cut dozens of 6mm strips of leather. I lined up a few strips side by side and basted them on the interfaced ponte with fabric glue, before stitching them down with a single centre seam. I then just kept lining up those strips until I liked the look of the pattern. I added leather strips to the front of the dress and to a panel at the bottom of the back of the dress. I only added the back panel because I was short of ponte. Yay for that though, because I think that back panel finishes the look! V8840 is a pattern designed for a top. 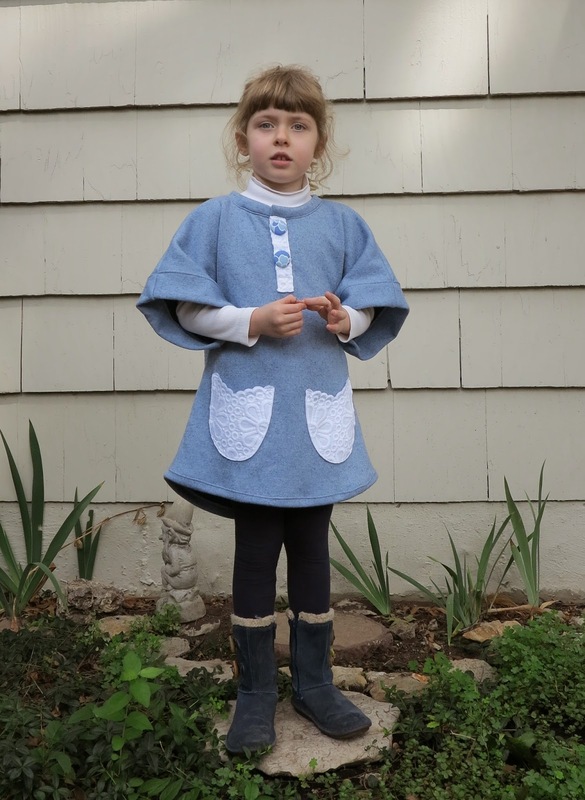 What I wanted was a slightly unfitted tunic that I could layer with layers upon layers of wool for a Midwestern winter. I’m pretty happy with what I ended up with. fused interfacing on the inside of the entire front dress pieces and to the back panel. This was needed to stabilise the ponte for stitching on all those leather strips. 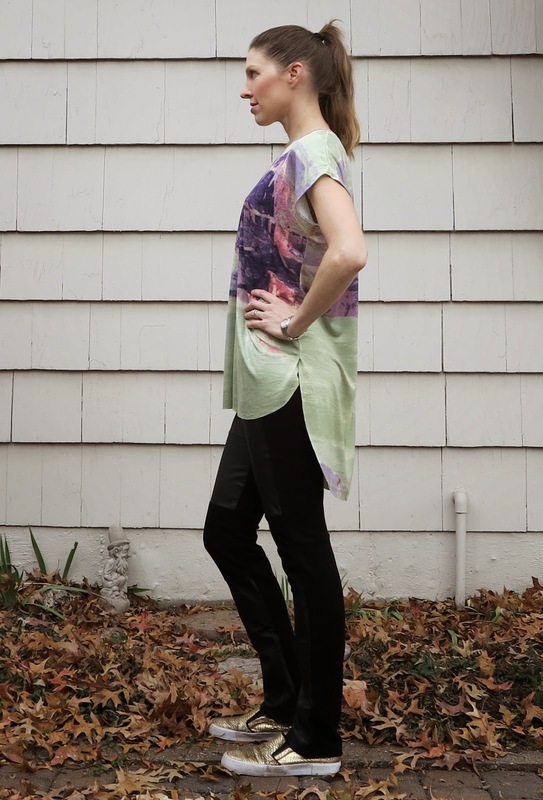 This entry was posted in leather, ponte, Tandy, Tessuti Fabrics, tunic, V8840 on September 15, 2014 by Debbie Iles. 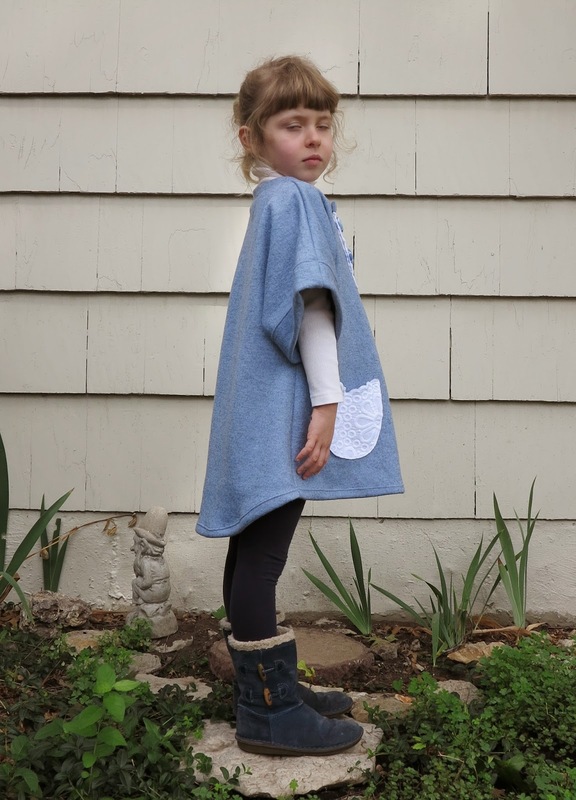 I’m not always in love with the clothes I make for my girls, but on this particular occasion, I feel like I’ve struck gold. I would wear this! 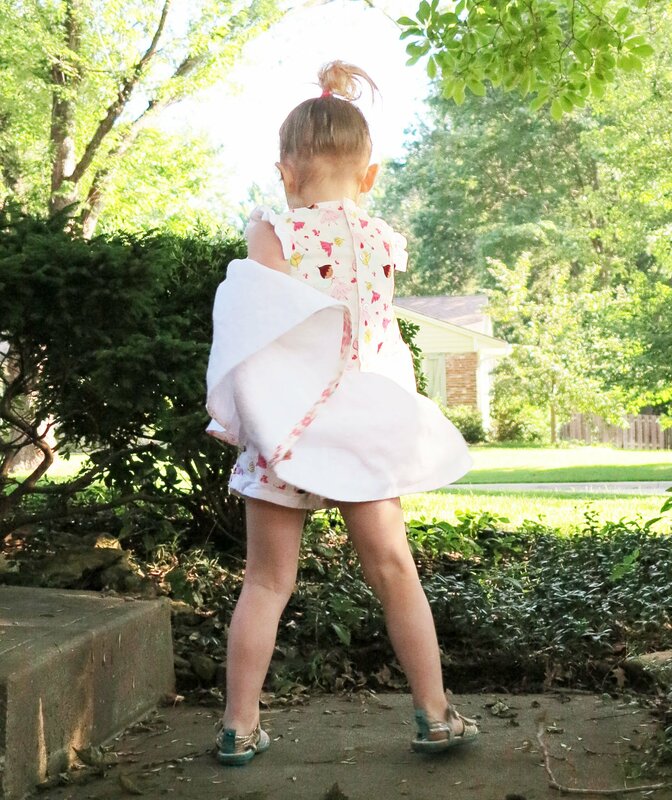 Usually, I’m trying to blend sewing what I want to sew for them with what I know they will like, and therefore, actually wear (read ruffles, fairies, and gathered skirts). It’s a delicate balance. 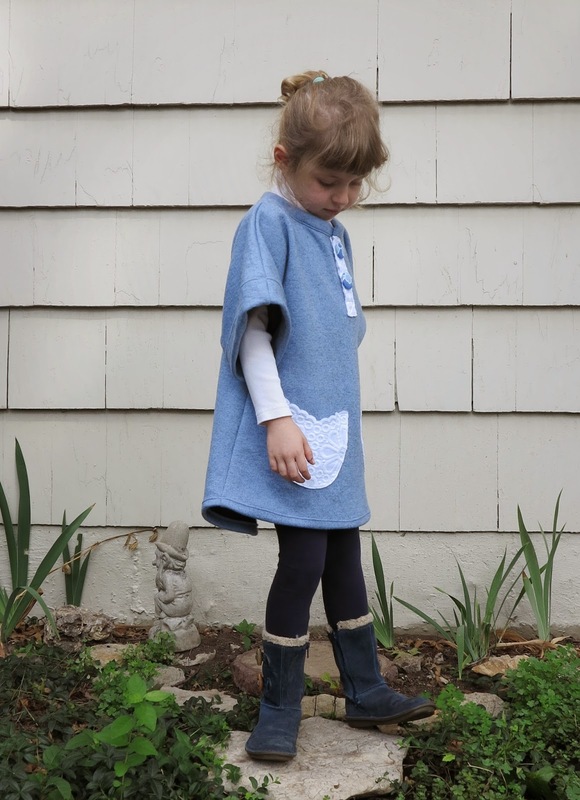 I also try to use up a lot of my fabric leftovers for their clothes, rather than spend money specifically on kid fabric. Now, if you saw my last post on the winter coat I made for myself, you will be familiar with this gorgeous double faced wool. It was a big birthday splurge but so worth it. I ordered a little more than I thought I would need, just to be certain that I would have enough for a long coat. 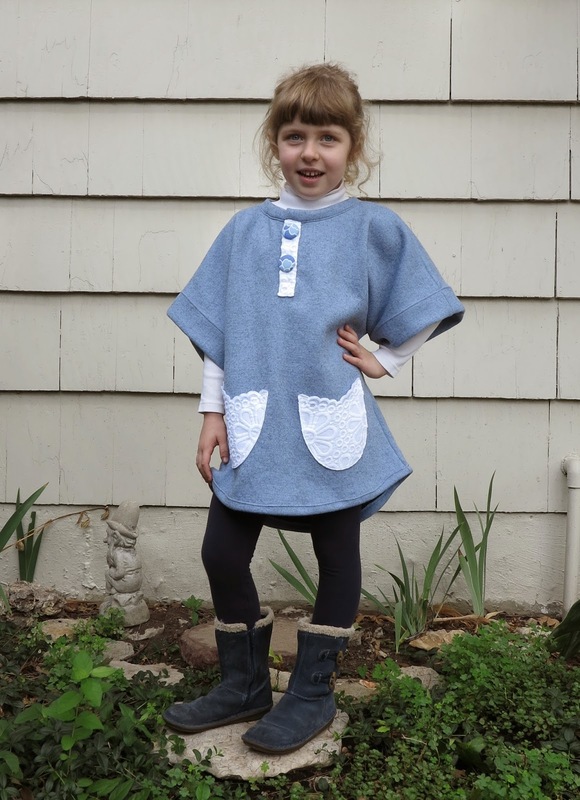 I also had this little tunic in mind on the off chance that I had any leftover. Luck was on my side. I had just enough for both makes, plus a few extra squares that will soon be patch-worked into another little dress. 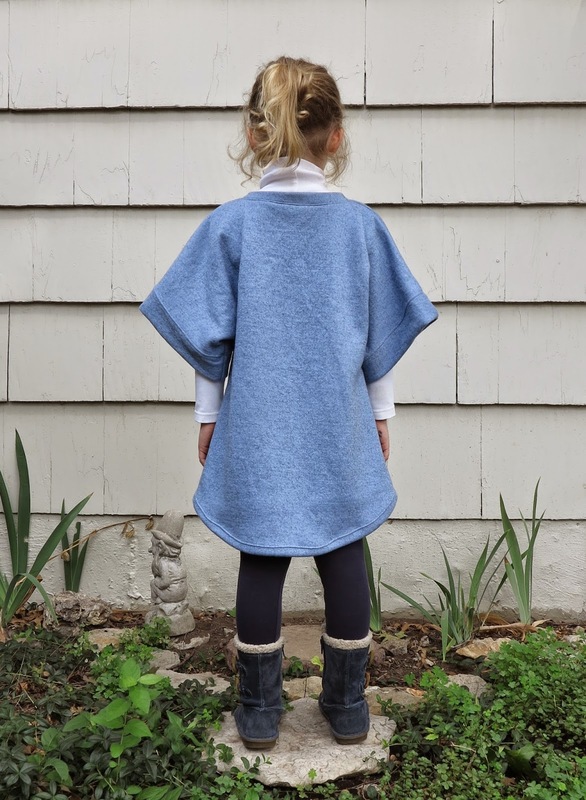 I love the oversized look of this tunic. 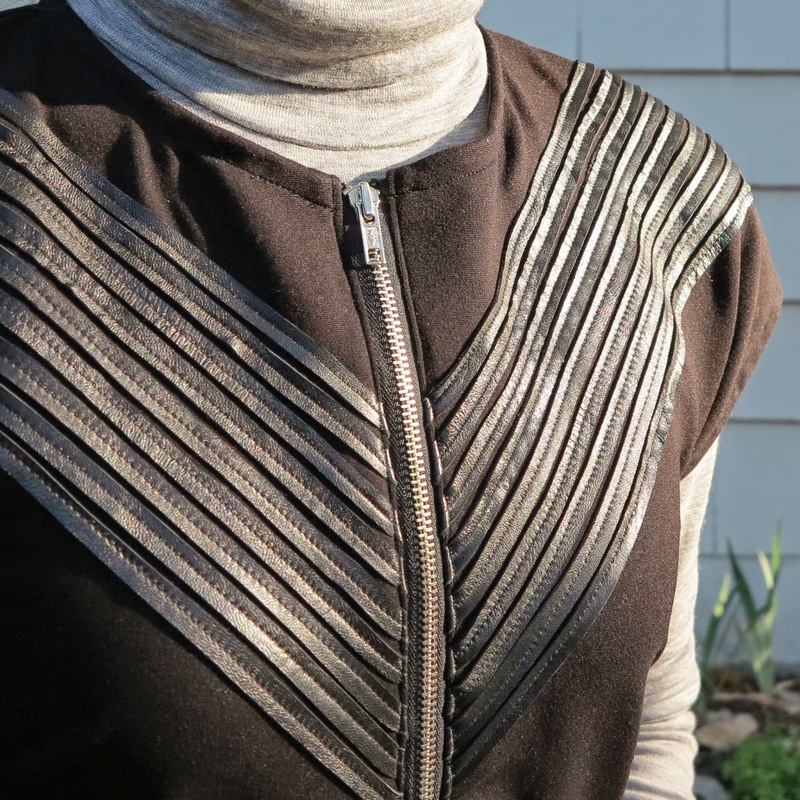 I drafted the pattern myself but I used the placket piece from Thread Theory’s Henley top, reminding me in turn that it’s been a while since any clothes for hubby have been on my job list. He keeps suggesting that I put up a chalkboard in the basement my sewing room, so that he can add what he wants to it. 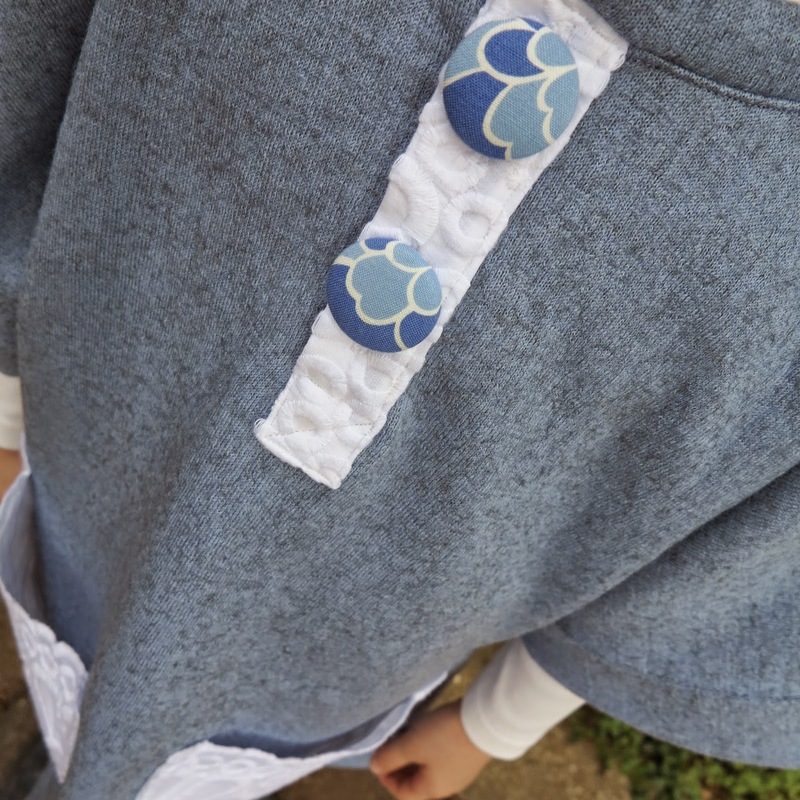 I covered the buttons with a few scraps of Japanese cotton. The pattern itself isn’t rocket science. It’s just two pieces, with pockets and a placket. 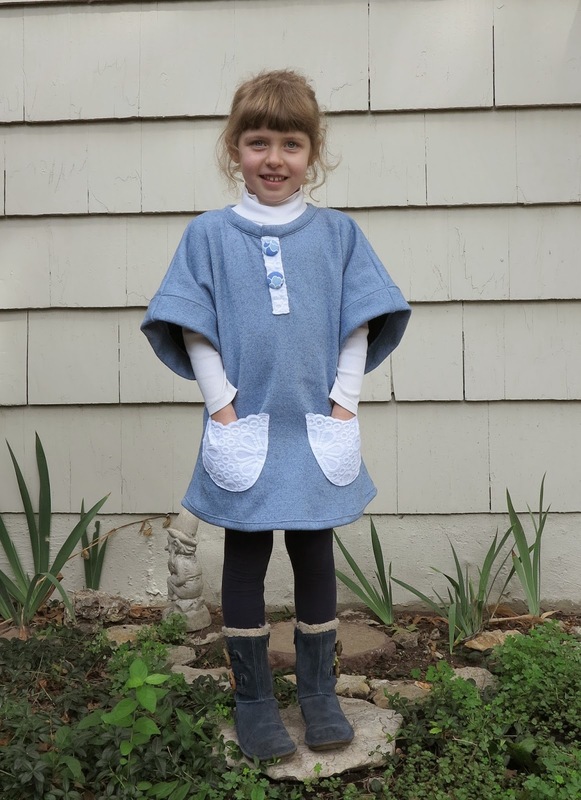 I made it large enough for my biggest girl (to be on the safe side and to guarantee maximum hand-me-down potential). I planned to give it to the peep it fit best. It fits them all but Miss Four fell in love with it first. 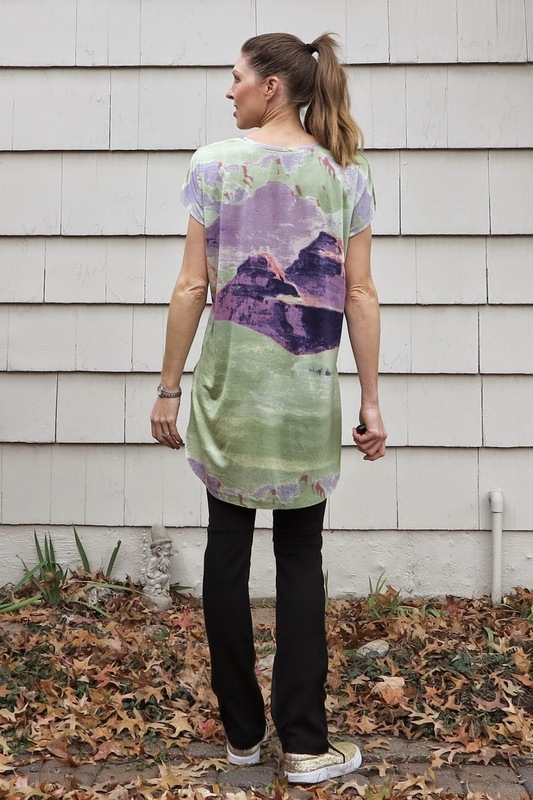 This entry was posted in dress, self-drafted, Tessuti Fabrics, tunic, wool on September 9, 2014 by Debbie Iles.